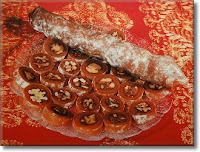 TheArmenianKitchen.com : Easy Roejig (Rojik) a.k.a 'Sweet Soujuk' - is that even possible? Easy Roejig (Rojik) a.k.a 'Sweet Soujuk' - is that even possible? I love roejig (aka 'sweet soujuk'), a traditional Armenian candy made from walnuts which are strung on long strings and thickly coated in fruit syrup. I ate a piece of roejig a few weeks ago, and with the first bite, I was taken back to my youth – specifically my maternal grandmother’s dining room where she would serve this on special occasions. It’s one of those recipes that I enjoy eating (sparingly), but don’t necessarily want to prepare. I posted the roejig recipe once before, but since a reader requested the recipe the other day, I figured I’d mention it again. The recipe I included in the original post came from the A.G.B.U.’s ‘Treasured Armenian Cookbook’. Making roejig is a tedious, time-consuming process. I wondered if there could possibly be an easier way to make this sweet delight. Compare the recipe below with the original one and you’ll see the difference. 1. Combine the cornstarch with the 1 cup water in a mixing bowl and stir to dissolve. 2. Add 1 cup more water. 3. Pour the mixture through a strainer to remove the lumps. Set aside. 4. In a saucepan combine the sugar and concentrated grape juice in 2 cups of the water. 5. Over medium heat, stir until sugar is dissolved. 6. Gently stir one-half of the sugar mixture into the starch mixture. Then add the remaining sugar mixture and cook over medium heat, stirring constantly, for 20 minutes, or until the mixture thickens. 7. Reduce the heat to low and cook, stirring, about 1 hour, or until the mixture forms threadlike pieces when dropped into cold water. 8. Pour half the mixture into an 11x7-inch pan liberally dusted with cornstarch. 9. Press walnut halves into the mixture in 3 or 4 close rows. 10. Pour the remaining mixture over the nuts. 11. Sprinkle with more cornstarch. 12. Cover with plastic wrap for at least 10 hours. 13. Using the walnut rows as your guide, cut the rojik into 3 or 4 rows. 14. Generously roll each strip into cornstarch. 15. Wrap each roll separately in wax paper and freeze until you are ready to serve. Then unwrap, bring to room temperature, and cut into slices about a quarter inch thick. That's an interesting way to do it ! Actually, I didn't know that was also called "Rojik", I was only provided with "sujuk" for a name ! - How to keep the sujuk (closed plastic box, metal box, covered...) and how long to keep it (at least, for the part which is not eaten immediately ;-) ) ? - Concerning the grape juice, a technical question : is the juice from any store/supermarket also relevant or is only the home made juice indicated ? (even if I do assume that the home-made will be better, for a first try, I was wondering) ? I know the traditional Bastegh is not suppose to be made during hot and humid weather, can this be made anytime during the year.